TX M.I.L.K. is a growing collection of conversations with the Lone Star State’s most fascinating moms. Some are running million dollar companies. Others are courageously building modern families. Some are even taking the “stay at home” challenge. But all have one thing in common: they’re doing inspiring things while raising tiny humans along the way. Moms Rock! was a free showcase put on by TX M.I.L.K. 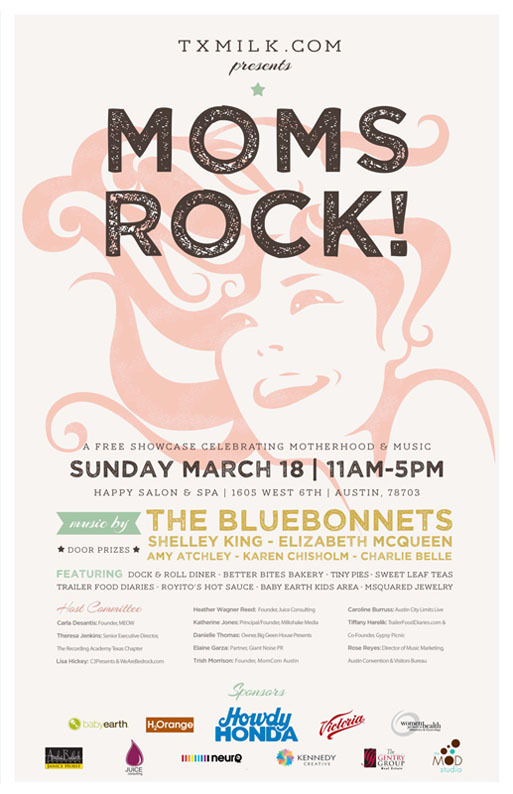 celebrating motherhood and music here in Austin. We had the pleasure of designing a poster for them and we love the way it turned out! So if you are an awesome Texas mom, stop their website and join in on the big Texas fun!